This a full golf tour package with sightseeing to Vietnam's finest golf courses in Hanoi . 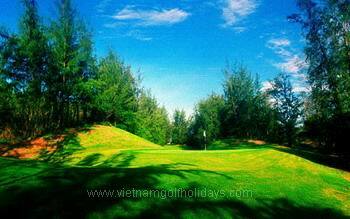 Phan Thiet, Dalat, Hochiminh , This golf tour allows you the opportunity to play on Vietnam’s scenic golf resorts. Sightseeing tours to visit the mystical Halong Bay or the ancient charming Hanoi City will be a highlights of the tours. Our representative /tour guide VietnamGolfHolidays will meet and greet you at the airport and transfer to the city for hotel check in. Free at your own leisure. Stay overnight in Hanoi. 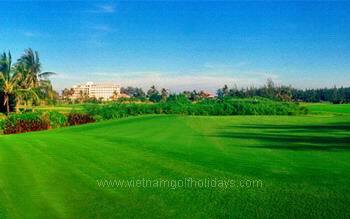 Enjoy a round of 18 holes golf in one of the finest golf resort - King's Island Golf Resort in the morning and later come back to Hanoi. Enjoy the traditional water puppetry show. Overnight in Hanoi. After having breakfast at hotel, we will drive to Chi Linh where you will enjoy a round at the Chi Linh Star Golf and Country Club. The Chi Linh Star Golf Course will feature a 36 hole golfing challenge, with every hole constructed and designed to international standards. In the afternoon, we continue driving to Halong City. Stay overnight at hotel in Halong City. 8h00 Depart from your hotel. Embark on a junk boat for an exploration of the legendary Halong Bay. This exciting five hour cruise will provide us a fantastic view of the picturesque scenery blending with the sky and some 3,000 limestone islands rising amazingly from the clear and emerald water. The limestone karsts formations are littered with beaches, grottoes and beautiful caves. Along the way we will anchor for a leisurely swim in a secluded cove and an enjoyable visit to one of the many hidden grottoes beneath towering cliffs. Transfer back to Hanoi. Stay overnight in Hanoi. Overnight in Hanoi. Am : Hanoi city tour : 1 hour cyclo tours, visit TranQuoc Temple and Hanoi old quarters. Lunch at the restaurant. Transfer to NoiBai airport to take 2 hour flight to Hochiminh city. Check-in hotel in Hochiminh city. and then we will take sightseeing tours to visit its landmarks.Overnight in Hochiminh city. Morning free at leisure and then we transfer you to the airport to take short flight to Dalat - Located about five thousand feet above sea level, Dalat enjoys a cool climate that doesn't burn the sensitive bent--or wear out golfers. Dependant on arrival time and day light hours, a few holes of twilight golf should be possible before dinner. Overnight at the Sofitel Dalat. Today, you will take the day off to relax and unwind. Go to the beach and soak in the rays. Transfer back to Saigon. Stay overnight in Saigon. - 6 lunch at local restaurant.